About 60% of cases of Alabama rot, which has killed more than 100 dogs in the UK, occur in the first three months of the year, researchers have found. New research by London's Royal Veterinary College is under way to try and discover more about the risk factors and spread of the disease. The cause of the disease, which first occurred in the UK in 2012, is still unknown. However, researchers have found there are more cases in autumn and winter. ​Most deaths caused by the disease have happened in Hampshire, Dorset and Greater Manchester. The research is being funded by the New Forest Dog Owners Group and charity Stop Alabama Rot. 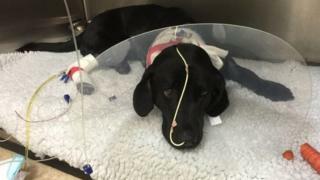 Michael Barlow's six-year-old black Labrador Lulu caught the disease in Lymington, Hampshire, in 2015 and survived. This motivated him to set up Stop Alabama Rot. "Nobody knows what's causing it, and for me that wasn't really good enough," he said. "Hence the funds are there to try and diagnose what the cause is and try and find out if there are any prevention strategies and potential treatments." Dr Kim Stevens, of the Royal Veterinary College, said current research, expected to conclude by the end of the year, would not identify the specific cause of the disease. She said it was instead designed to look for geographical patterns, as well as environmental and climatic risk factors. A "very obvious" pattern already found was linked to seasons, she added. "There are limited cases over the summer whereas everything starts to pick up in November and at least 60% of the cases occur in the first three months of the year, so it's very much an autumn/winter pattern that we're looking at."